“There are some great female voices around now – but I’m not one of them and I wish I was,” says Shirley Collins early on in this documentary of her life. It’s not self pity speaking. Feted in the 50s, 60s and 70s on the British folk revival circuit, Collins and her portative organ-playing sister Dolly were spellbinding stars of the scene. But then Collins suffered an emotional trauma that muted her talent for nearly 38 years. 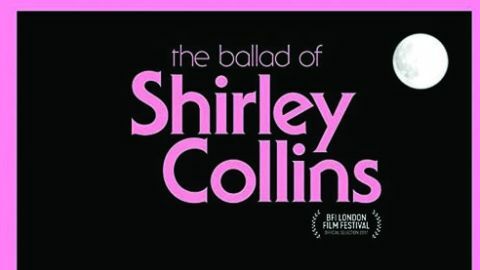 This film looks back on Collins’ extraordinary life, from the demure schoolteacher who, in 1959, fell for archivist Alan Lomax and journeyed with him to the US to collect an important body of folk song field recordings, to artistic acclaim, lost love and lost confidence and, eventually, aged 80, a rebirth with this year’s Lodestar album. Black and white reconstructions are a cute way to embellish her backstory, but there’s plenty of wit, warmth and wisdom in the now as Collins joins the bonfire parade in the streets of current home Lewes, or swaps tales with the decorated tribes celebrating the yearly pagan knees-up, Jack-In-The- Green, in her birthplace Hastings. Hats off to long-time friend, Current 93’s David Tibet – chatting with Collins at a kitchen table, shared treasures strewn – who constantly urged her to sing again. The results, recorded in her living room, are a triumph in the face of torment.